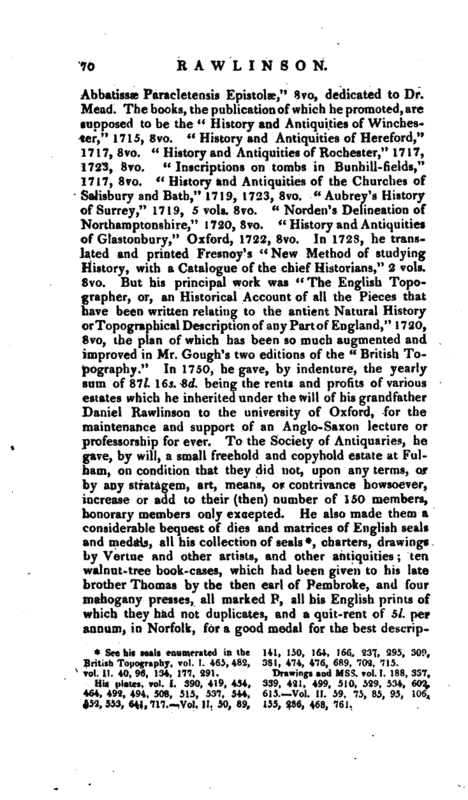 See his seals enumerated in the British Topography, vol. I. 465, 482, vol. II. 40, 96, 134, 177, 291. His plates, vol. I. 390, 419, 454, 464, 492, 494, 508, 515, 537, 544, 5*2, 553, 641, 717. Vol. II. 50, 89, ?41, 130, 164, 166, 237, 295, 309, 381, 474, 476, 689, 702, 715. Drawings and Mss. vol.1. 188, 337, 339, 421, 499, 510, 329, 534, 609, 615. Vol. II. 59, 75, 85, 95, 106, 155, 286, 468, 761. One reason, among others, which he gave for this, was, that their then secretary, Mr. Gordon, was a Scotchman. Dr. Taylor was persuaded that this precaution was taken by the doctor to prevent the right owners’ recovering their own. He supposed that Dr. Rawlinson made no scruple of his buying all that was brought to him and that, among the rest, the ms. and printed copy of Demosthenes, which was lost on the road, and the detainer t>f which he had cursed very classically, would be found among the spoil. The ms, belonged to Jauies Harris, esq. 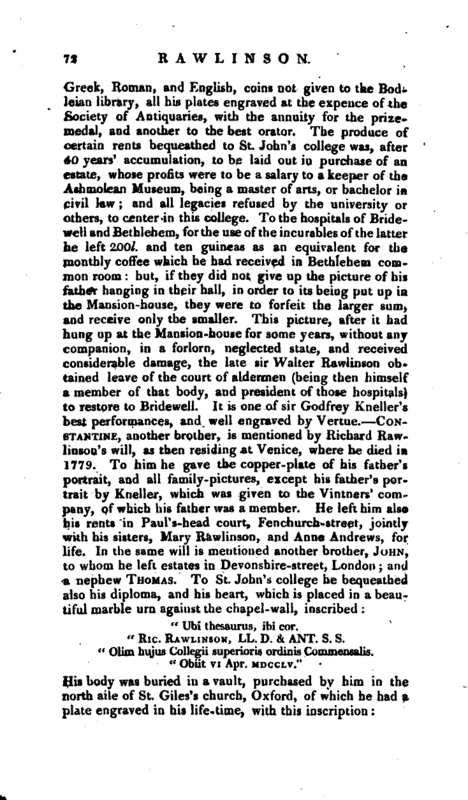 of Salisbury, by whom it was sent to Cambridge. 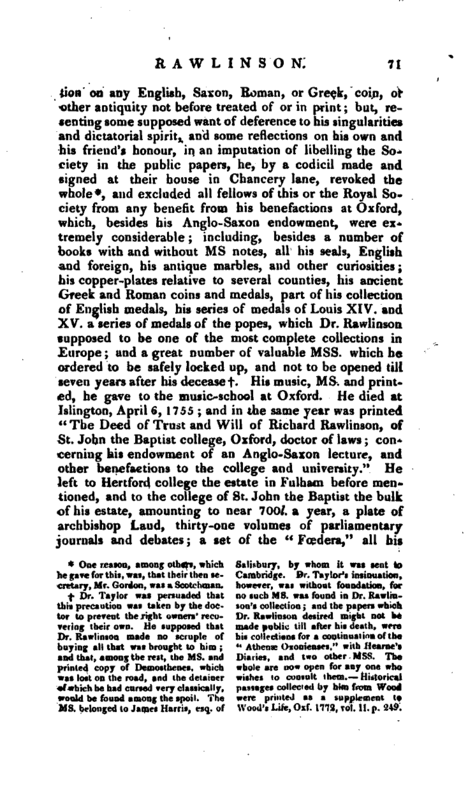 Dr. Taylor’s insinuation, however, was without foundation, for no such ms. was found in Dr. Rawlinson’s collection; and the papers which Dr. Rawlinso desired might not be made public till after his death, were collections for a continuation or the “Athenæ Oxonienses,” with —Hearne’s Diaries, and two other Mss. The whole are now open for any one who wishes to consult them. 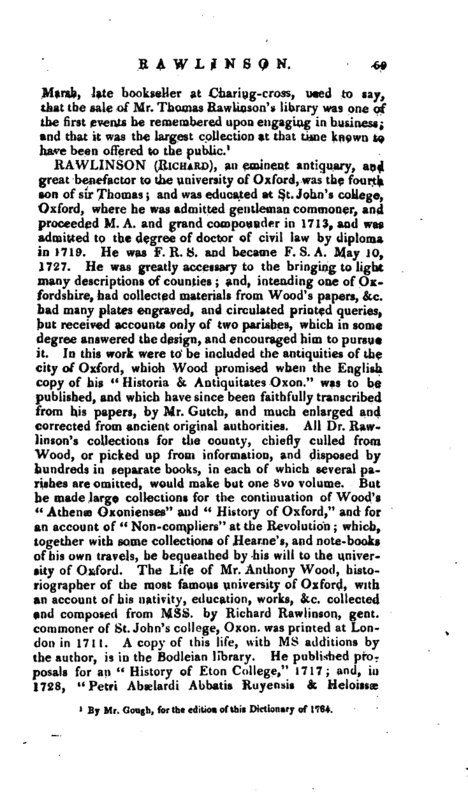 Historical passages collected by him from Wood were printed as a supplement to Wood’s Life, Oxf. 1772, vol. II. p. 249. Ric. Rawlinson, LL. D. & Ant. S. S.
"Olim hujus Collegii superioris ordlnis Commensalis. trsaujlov - Vdut in Speculum. Manet omnes una nox Non raoriar omnU. Hoc Dormitorium 8 ped. lat. 8 ped. long. Pallida niors aequo pulsat pede. Semel est calcanda via lethi. R. Rawlinson, LL.D. R. & A. Ss. Obiit vi Apr. Mpcclv. set. LXV." 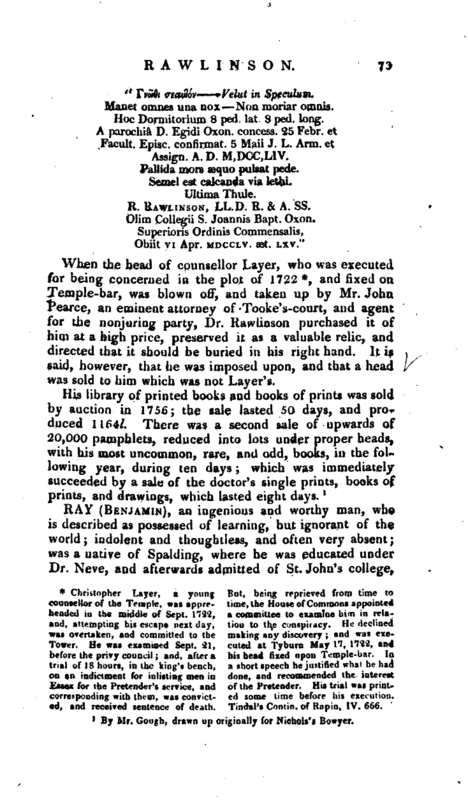 When the head of counsellor Layer, who was executed for being concerned in the plot of 1722*, and fixed on Temple-bar, was blown off, and taken up by Mr. John Pearce, an eminent attorney of Tooke’s-court, and agent for the nonjuring party, Dr, Rawiinson purchased it of him at a high price, preserved it as a valuable relic, and directed that it should be buried in his right hand. It is said, however, that he was imposed upon, and that a head was sold to him which was not Layer’s. 1 By Mr. Gough, drawn up originally for Nichols’s Bowyer.